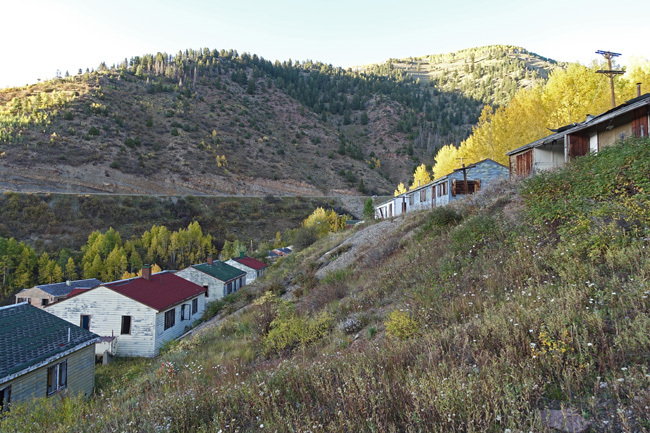 The ghost town of Gilman, Colorado sits atop Battle Mountain overlooking Eagle Gulch. 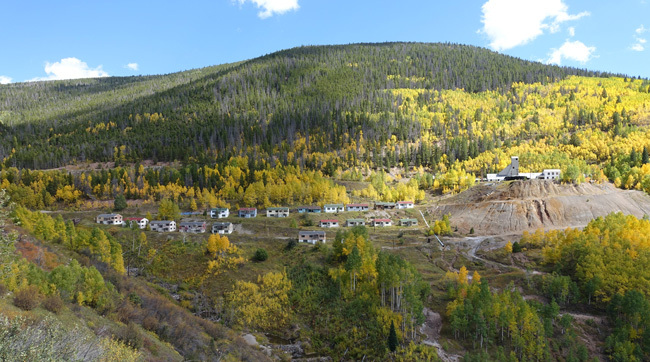 For nearly a century, mining operations poured so many toxic pollutants into the ecosystem that the EPA has declared the area off-limits. 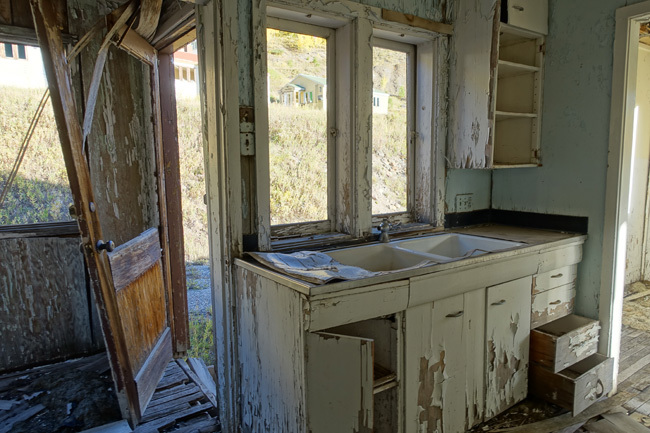 After an incredible day of exploring the dying town of Thompson Springs, Utah, an abandoned missile launch facility, and several other Utah ghost towns, I crossed into Colorado. 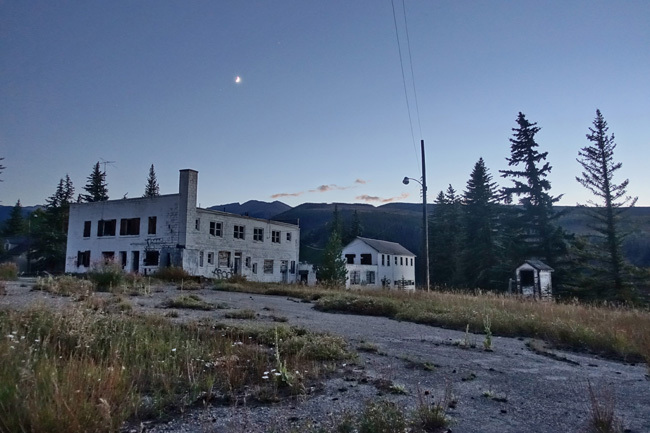 I got a good night's rest and then set out to explore the mining ghost town of Gilman. It was apparent that I wouldn't have time to see everything Gilman had to offer before sundown, so I'd need to spend the night. I drove around for a while, looking for a place to park. 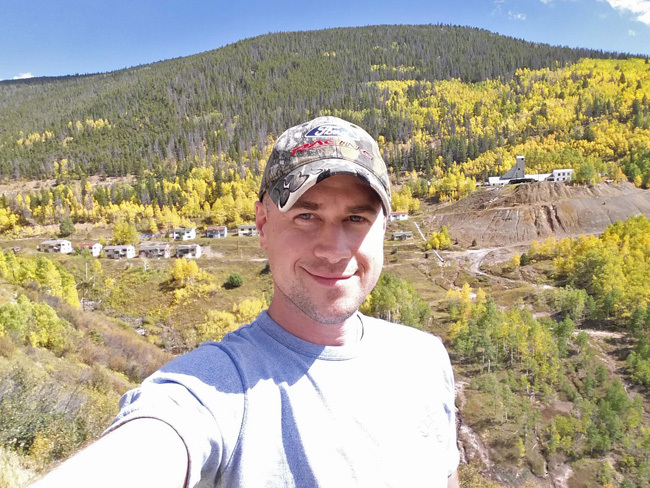 It didn’t seem wise to leave my car on the side of the highway overnight, so I decided to park in Minturn, a town a few miles west of Gilman, and hike the rest of the way. I packed some snacks, plenty of water, and a lightweight sleeping bag. 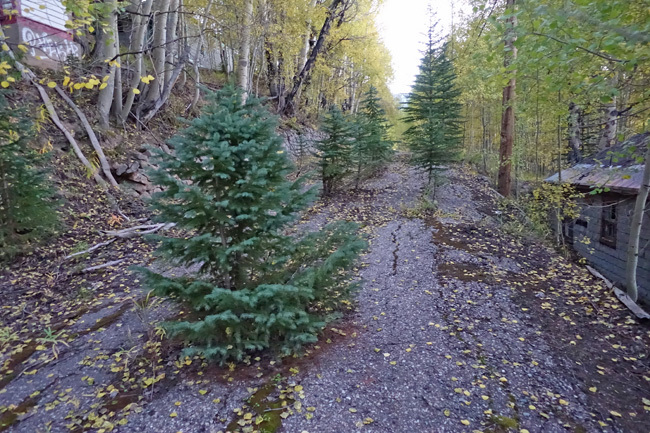 I walked along the old unused railroad track that once hauled ore from the Eagle and Belden mines. 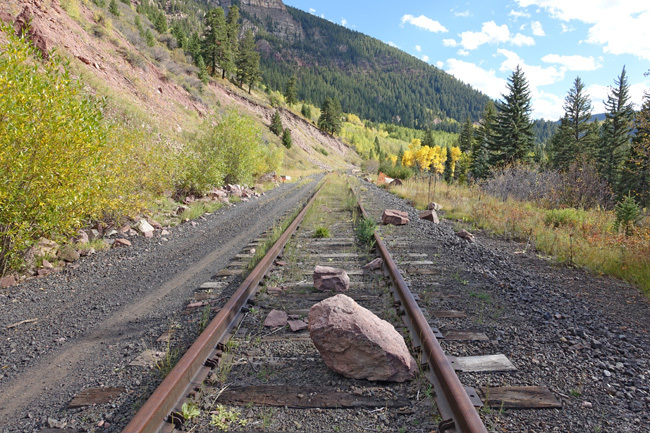 Weeds pushed up through the gravel between the railroad ties and boulders had tumbled onto the rusting tracks. Along the way, I passed a grim sight: the severed leg of a cow, and later, its rib cage, spine and skull, all picked clean (I've omitted the pictures from this article, but if you're interested, the macabre images can be viewed here). It was a good 5-mile hike, but after spending the entire morning behind the wheel, it felt good to stretch my legs. As an added bonus, autumn was in full swing and golden foliage accented the landscape. In the distance a pipeline ran parallel with the railway, carried by a tall wooden trestle. As I crossed the railroad bridge over the Eagle River, I saw that the pipeline was broken, a large section of it lying on the riverbed. I thought little of it at the time. Then I read an EPA report written about Gilman in 2013. 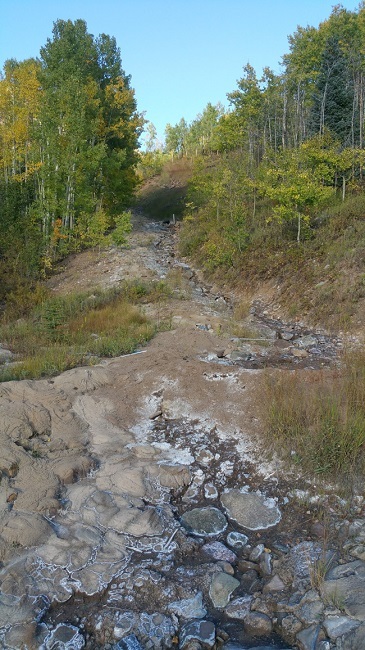 According to the report, the pipeline delivers contaminated water from collection points near Eagle Mine to a water treatment plant. 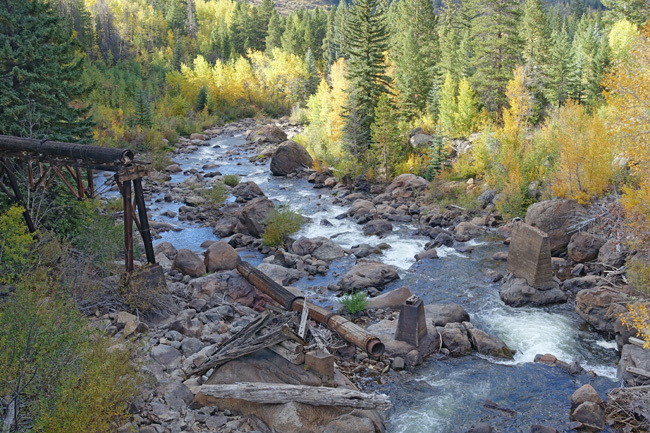 The EPA report mentions "Visible leaks in the mine water conveyance system in the wooden trestle as indicated by orange-colored icicles and staining on rocks and grass where leaks occur." A bypass line was built in 2010 when the trestle line froze, but it didn't prevent further leaks from occurring. 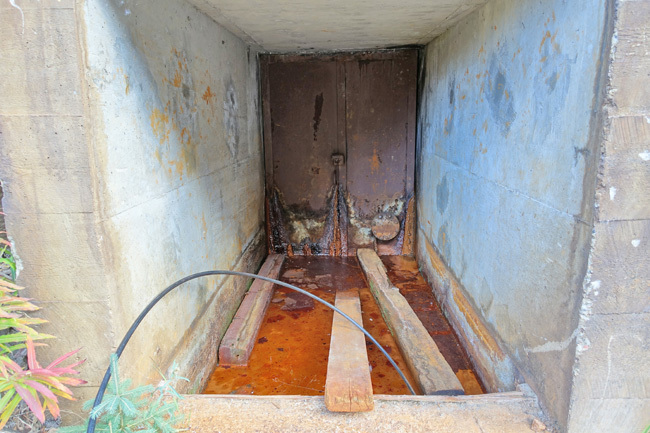 The EPA report states that an "incident occurred in November 2012, when approximately 400,000 gallons of raw water were released to the area due to a rupture in the conveyance system." Needless to say, I wouldn't recommend drinking from Eagle River. 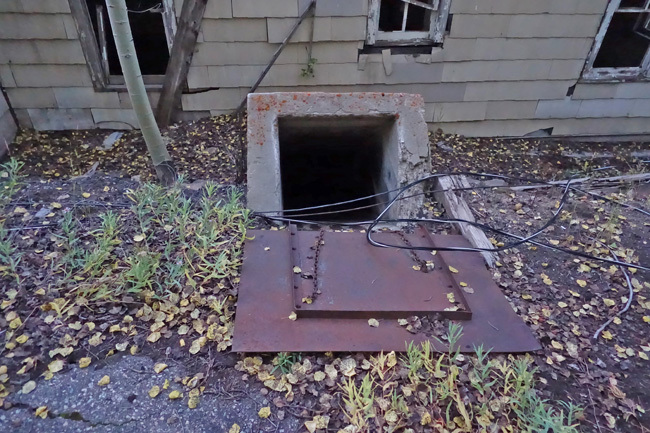 A short while later, I reached the base of Battle Mountain, and found the entrances to several mines, which were sealed off. 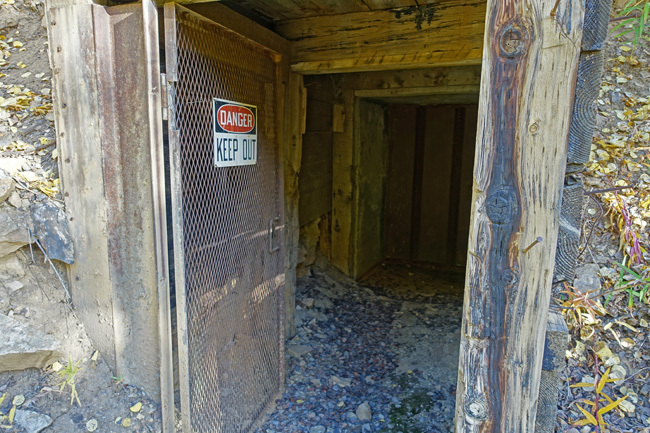 Given the toxicity of the area and danger of old mines, I had no intention of exploring them anyway. There are a number of mines in the area, including Ida May, Little Duke, Ground Hog, Iron Mask, May Queen, Kingfisher, Little Chief, Crown Point, and Little Ollie. 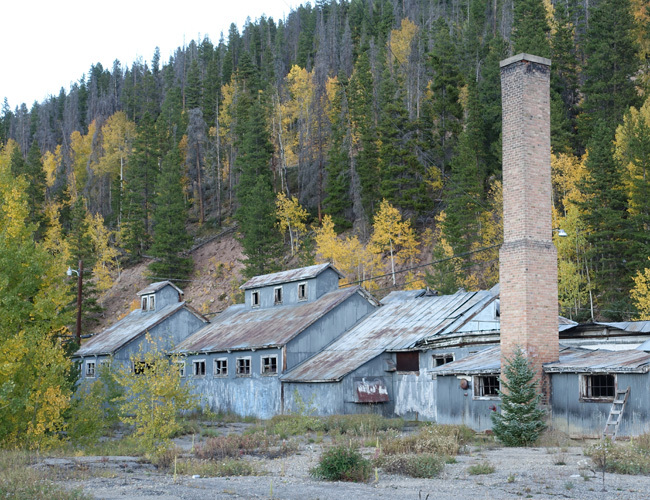 But the most famous are Belden Mine and Eagle mine, which were established in 1879. 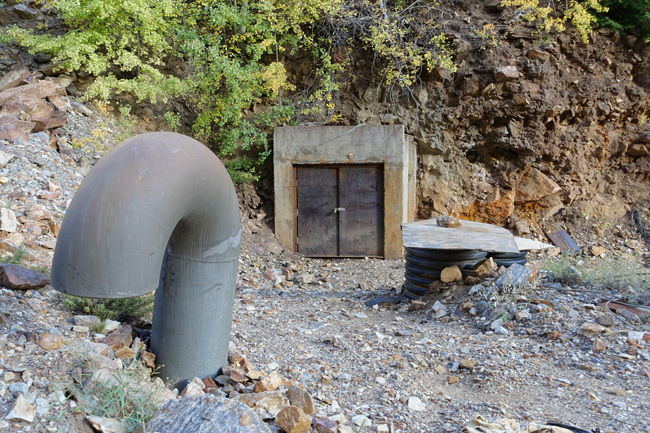 According to the EPA, the network of mines includes "an estimated 70 miles of underground mine tunnels", from which an astonishing 8 million tons of mine waste was excavated and deposited into the ecosystem. 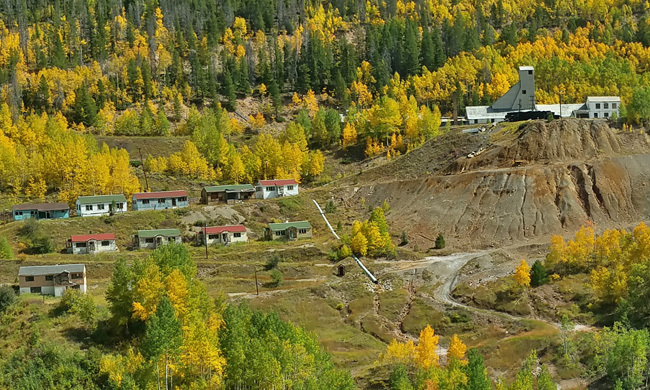 Eagle Mine was one of the largest zinc mines in the United States and produced over 12 million tons of ore over the years. 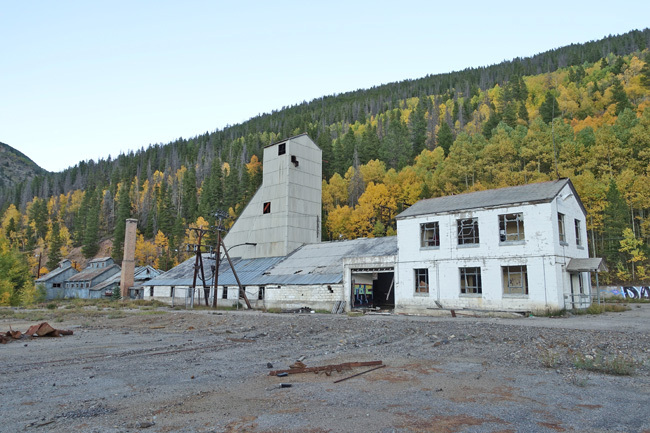 Zinc from Eagle mine was especially important for the war effort during WWII. Massive amounts of gold, silver, copper, and lead were also excavated. 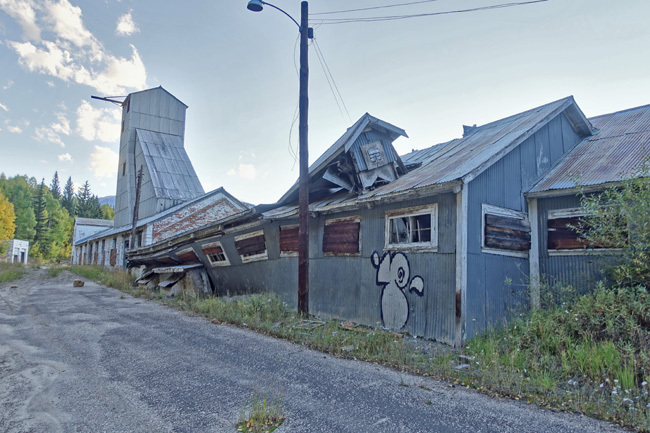 The New Jersey Zinc Company began buying up property in 1912, eventually purchasing the entire town of Gilman and all of the mines. 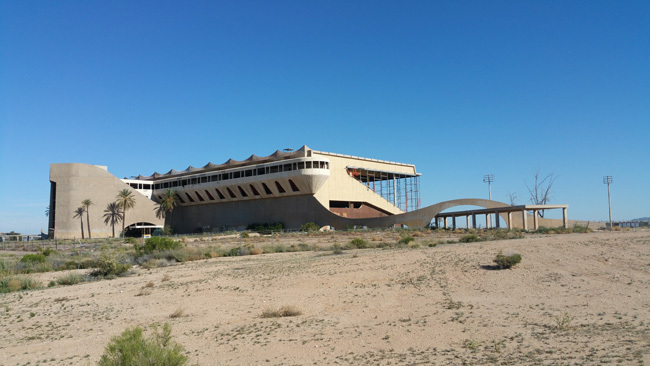 Most of the mining operations ceased in December of 1977, except for limited copper and silver production. In 1984, it closed for good. 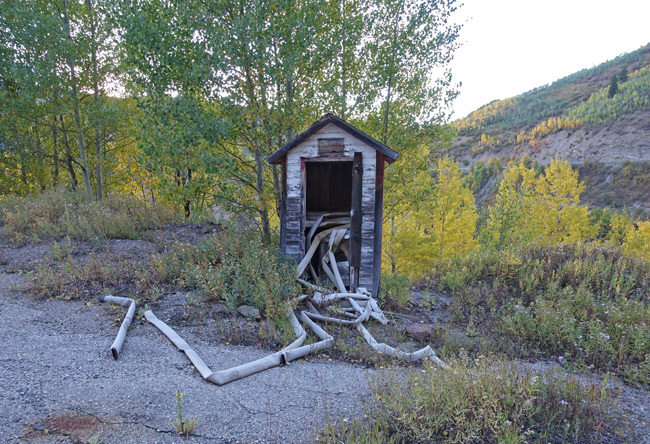 The pumps were deactivated and the mine was allowed to flood. Shortly thereafter, the EPA declared the area a Superfund site due to the massive amounts of pollutants that had been released into the ecosystem and placed it on National Priorities List. CBS Operations, Inc. (yep, the same CBS that owns the television network) was deemed responsible for the cleanup of the site. It seems odd, but it makes sense. Apparently CBS bought Viacom International, Inc., which owned controlling shares of New Jersey Zinc Company, which operated the mine. Gilman is 1000 feet above the mine entrances and would have been a very steep climb. Fortunately I was able to hike up the Rock Creek, which was mostly dry, except for a few trickles of water. The stones along the riverbed were encrusted in white mineral deposits. 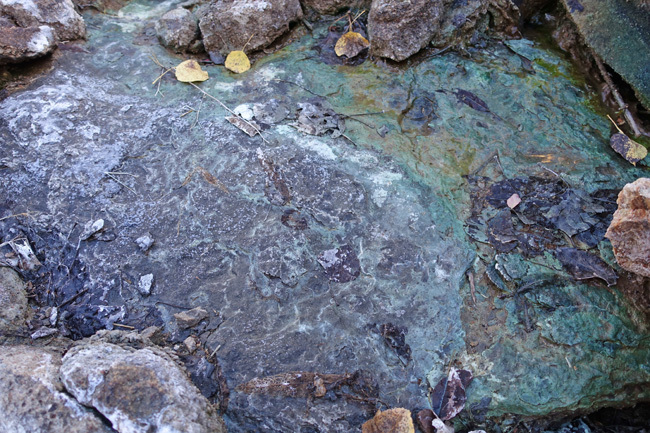 The water that flowed through it was tinted blue-green in some places and orange in others. At an elevation of about 9000 feet above sea level, I had to stop to catch my breath a few times on the way up. 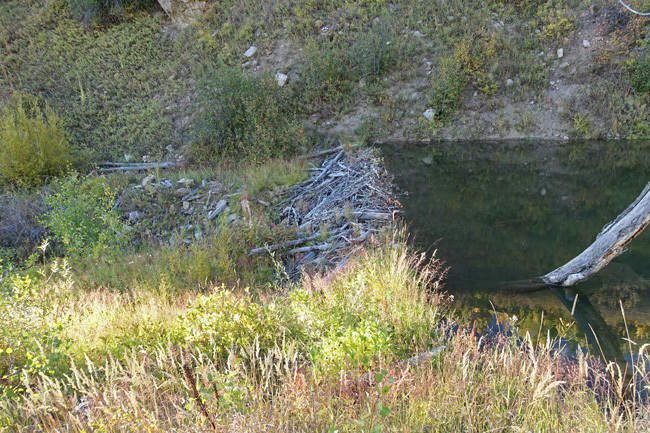 Near the top, I found that the creek was kept at bay by a beaver dam. 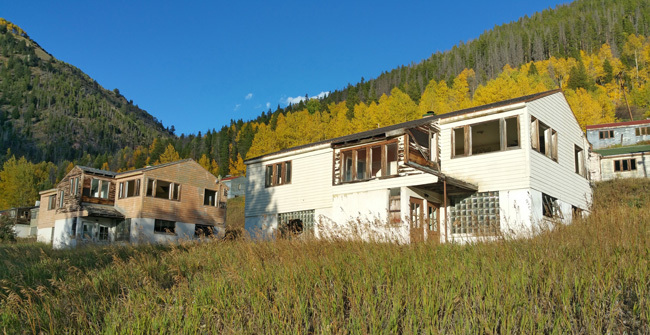 I reached Gilman tired and out of breath, but was immediately invigorated by the sight of several rows of abandoned homes. 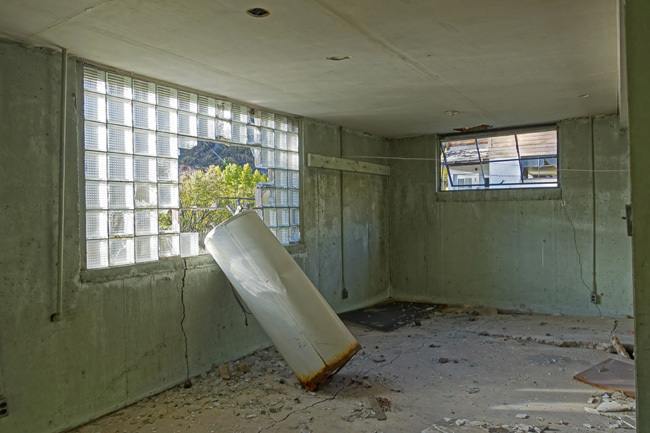 I was supposed to meet a friend there who also loves exploring abandoned places (check out her Instagram here: https://www.instagram.com/caroleyene/), but we didn't end up meeting. Just before I arrived, she saw a woman giving a tour of the place and quickly got out of there. 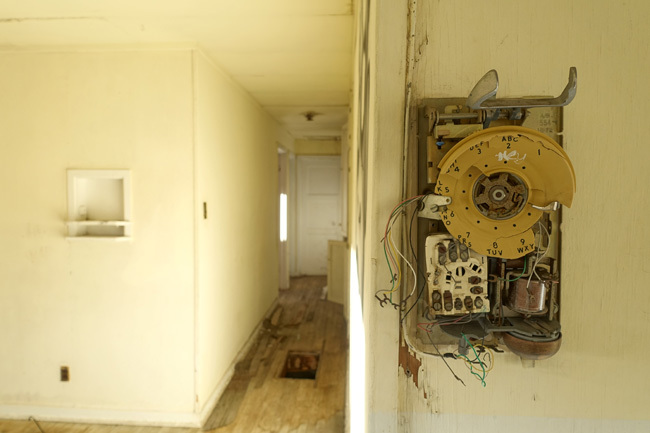 I ducked into the basement of the nearest house and had a look around. 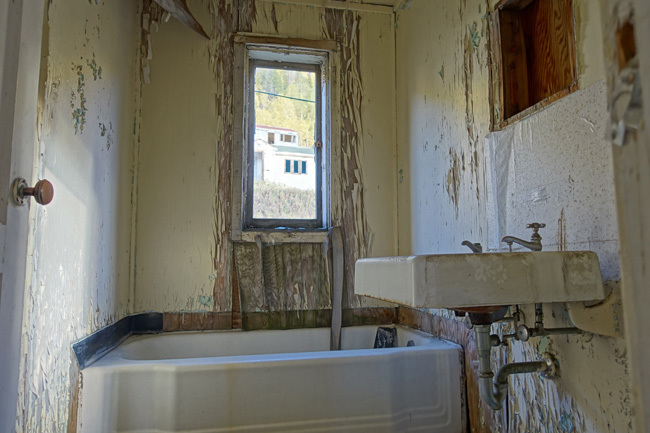 The houses were mostly empty and many were badly weathered. It didn't help that most of the windows had been smashed. 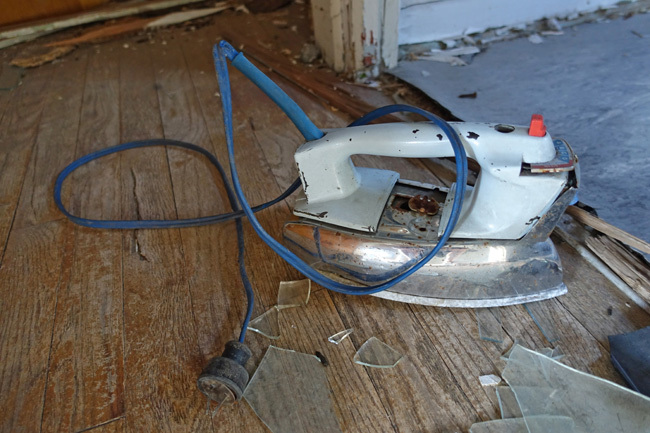 A few odds and ends were still lying around in a few of the homes, including an iron that looked very much like one my grandma used to have. Most of the homes had excellent views. 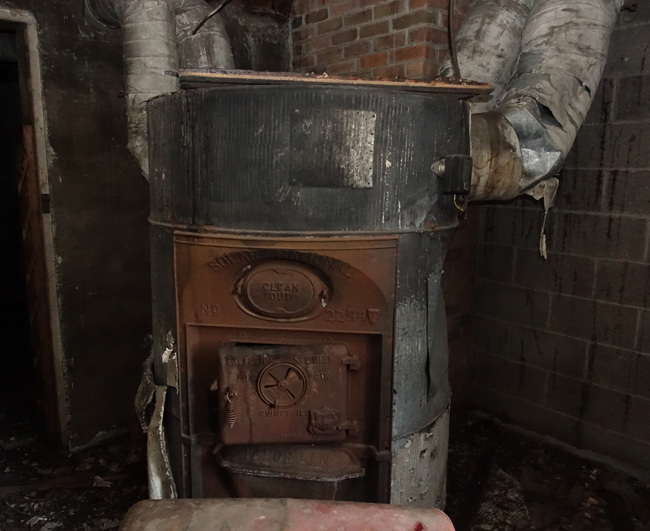 The homes had coal chutes and were heated by furnaces. I found it ironic that this furnace bore the name "Solar National." 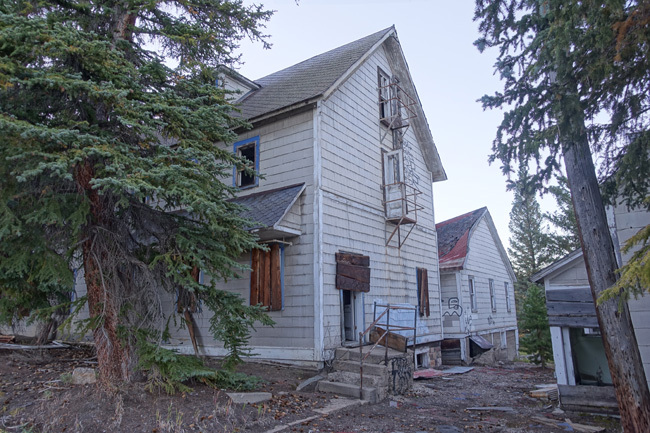 Gilman was founded in 1886 by prospector John Clinton and was originally named after him. 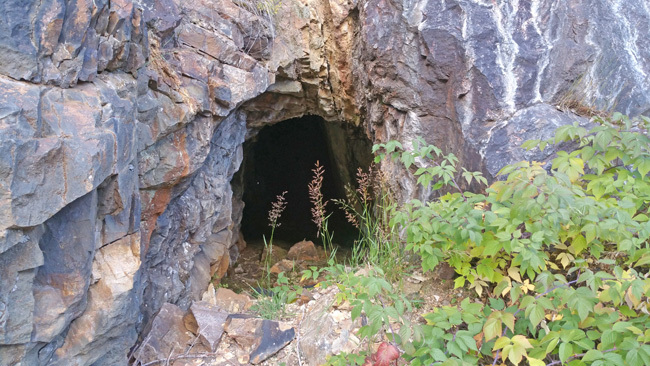 The name was later changed to Gilman in honor of Henry Gilman, a well-liked superintendent of the Iron Mask Mine. In 1899 the town was decimated by fire, in which half of the structures were destroyed. I strolled through the quiet neighborhood in a state of awe. It looked like it was once a beautiful little community. 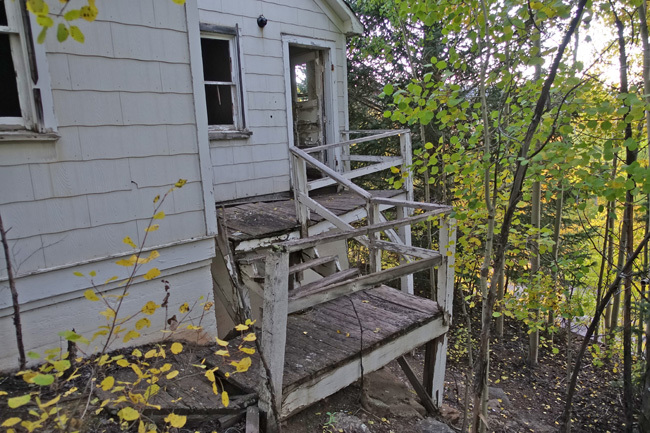 Now the porches are sagging and decrepit. Pine trees grow up through cracks in the asphalt. Nature always finds a way. 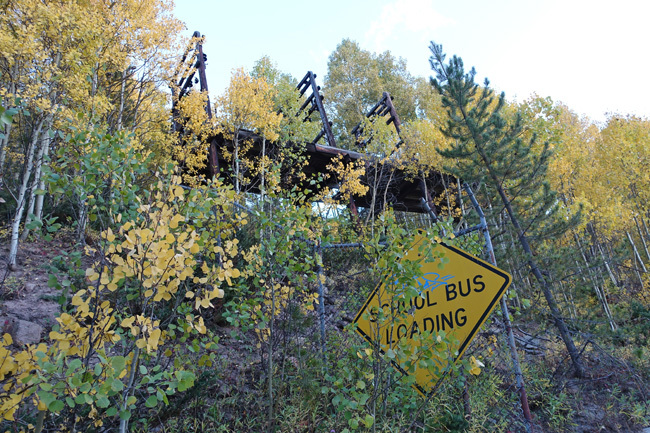 It is strange to think that children once lived here and school buses passed through the crumbling roads. A large section of the building is in the midst of collapsing in on itself. There are also quite a few little structures that house emergency fire fighting equipment. Vandals have opened them all up and pulled out the hoses. 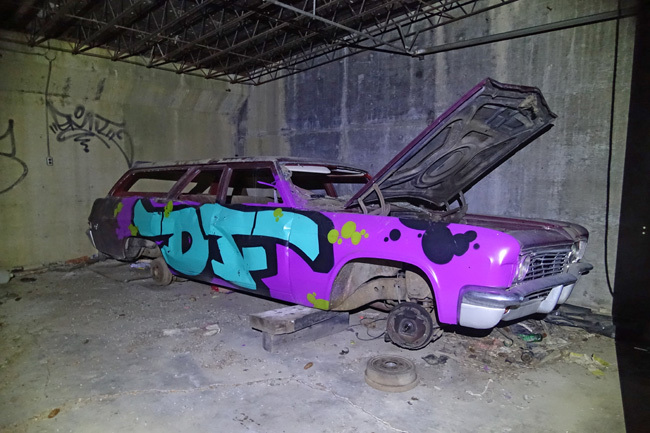 A row of garages contain trash, furniture and several old cars covered in graffiti. It was still early when the sky turned black, but the day's exertion had worn me out. I took a few pictures of the administration buildings in the waning light. After the sun disappeared, it quickly became old and windy outside, so I sought shelter. In one of the basements I found a roll-away bed frame that wasn’t too rusty, and decided to call it home for the night. It wasn’t super comfortable, but better than the floor would have been. In the light of morning, I realized I had barely scratched the surface of Gilman. 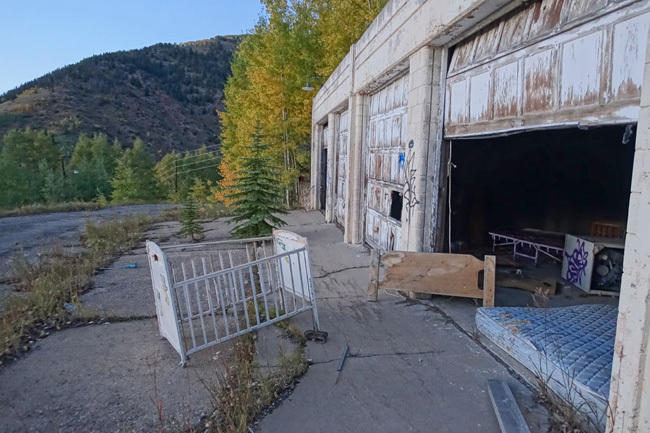 I still hadn't explored the abandoned laboratory, theater, workshops, ore processing facility and mining equipment. A full day of exploration awaited me. To keep this article from becoming incredibly long and unwieldy, I'll fill you in on the rest in my next article. Cripes--this is neat, but aren't you EVER scared??????????????? You're scaring me, staying out there all alone. Oh kiddo. Be careful! And yes, looking forward to more on this! Thank you, Sue :) It was definitely one of the most interesting places I've explored. I planned thoroughly, brought warm clothes, plenty of water, snacks, and pepper spray. I felt like I was pretty well prepared for the possible hazards, so I wasn't scared at all. I didn't go into the mines; those seem extremely dangerous no matter how well you prepare. Very interesting article and I can't wait for the second part. Thank you! I'll be posting more in a few days. That sounds like a scary encounter. I've heard similar stories, but when I went there it didn't seem like there were any security measures. I ended up running into 4 groups of other explorers there. Fasinating place, love your photos! I just found this and you mister Jim and as someone who loves history and abandoned places, thank you so much for respecting them! It warms my heart so to know there is some one like you about :) please stay safe and have a wonderful time! Thank you so much, Ethan! I really appreciate it. 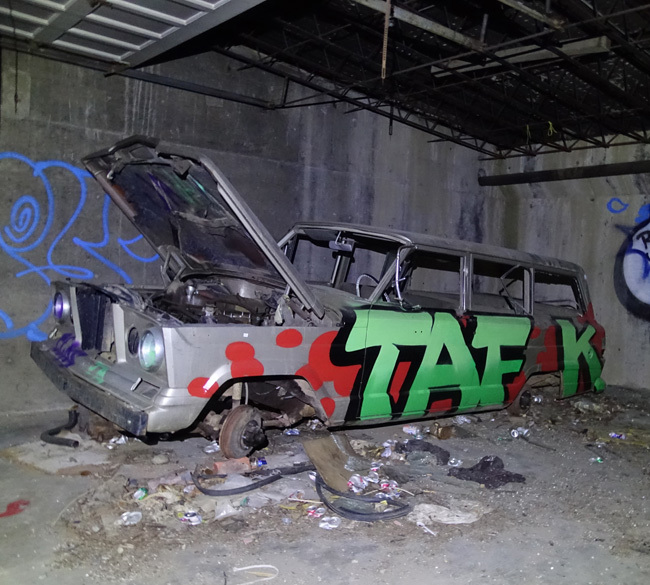 I'm always glad to meet others who appreciate abandoned places and their history. I loved this one! Pictures are great and yes, even the ones with the animal parts! If possible, can someone tell me the name of the person who owns Gilman, and how to contact him? My Grandfather worked in the mine. It's sad to see how run down the town has become. I remember going into town with my grandmother many times. 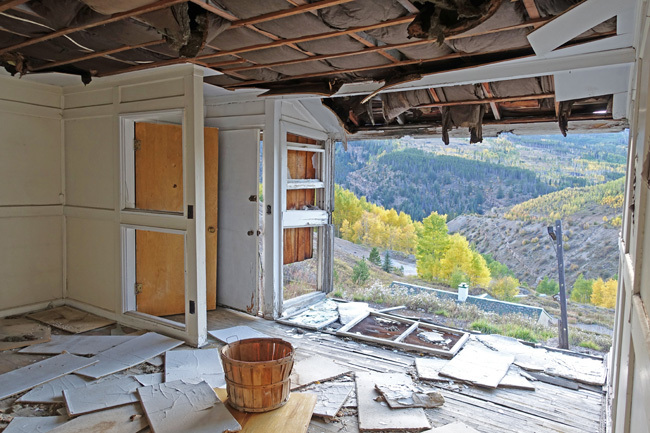 They lived in a house that is down from the town, just off the highway, as you go towards Minturn. It was like a bed and breakfast. They had many of the miners stay there too because they had to travel too far to get home. My mother and aunts grew up in Gilman. It must have been neat place back in the day. I wish I could have seen it then. Thank you for sharing your memories. my grandmother grew up there, and wrote a pretty detailed memoir about it. I'm going to try and find it, and see which pictures I can connect with the buildings she wrote about. (Note: she died very young of cancer, and we'd always assumed it was related to the toxicity there.) I tried to visit in the late '80s but was too much a rule-follower then to have thought about finding my way in. Now I'm tempted :) This is extremely cool--thanks!! I would love to read your grandmother's memoirs! She must have some very interesting stories. Are they published anywhere? I love exploring these places. Sadly they keep getting cut off and boarded up with tight security :( Would love to contact you though! i lived in vail in 1975 as a kid and my best friend arturo guzman had a cousin working there in the mine. He brought out a huge chunk of turquoise and showed me.